Potato Gratin with Cheese, Sage, Thyme for Cooking easy fall side dish. I make this in the fall when I still have fresh sage in the garden. If you don't, dried will work. This will be for 2 meals. Put 1/3 of the sliced potatoes in the bottom of small baking dish - just big enough to hold everything. Put 1/2 of the sage and 1/3 of the cheese on potatoes. 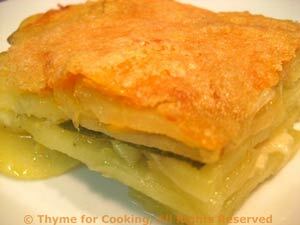 Top with a layer of potatoes and final layer of cheese. Pour stock over all, cover and bake (400F, 200C) for 40 minutes. Remove and sprinkle with Parmesan.